Interested in learning more about babywearing? Curious about a particular type of carrier? Join us at an upcoming meeting for hands-on learning and access to our broad library of carriers. 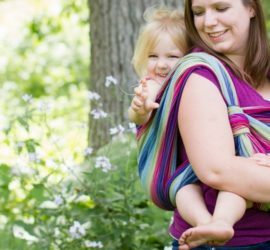 Madison Babywearing's library offers over 150 carriers for you to explore! 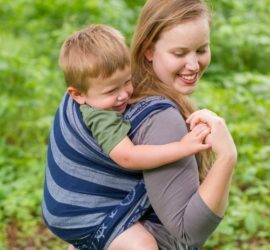 Learn more about the benefits of babywearing, the different styles of baby carriers, and the importance of safe babywearing practices. Madison Babywearing holds one weekday and one weekend meeting per month, along with additional outreach events and smaller workshops. Madison Babywearing maintains a growing library of carriers, which are available to try on during our meetings and check out between meetings. While our meetings and online community are free and open to the public, there are definitely benefits to becoming a member! Learn more. Madison Babywearing is a non-profit, volunteer-driven organization dedicated to helping caregivers discover the benefits of babywearing. We support babywearing education and outreach to make babywearing a universally-accepted practice. Explore our site to learn more! We’re excited to announce that BWI-Madison is now Madison Babywearing. Sadly, the national Babywearing International organization filed for bankruptcy and dissolved, so we are no longer be an affiliated chapter of Babywearing International. However, we want to assure you that our organization will continue to thrive as a community of babywearers. We still wish to serve as a resource in the Madison area. We will continue to host our twice monthly meetings to offer in-person babywearing support, as well as offer outreach services and maintain a learning and lending library of carriers for the community to use. We’ll also still be available for online help in our Facebook group. While our name and look might be changing, the resources and education the Madison Babywearing community has come to appreciate will still be here. We appreciate your support and patience as we’ve been working through this transition. You can stay updated on our transition at our Facebook page. Happy Babywearing!